Took the BTS all the way just for the tarts and i think it was quite worth it. 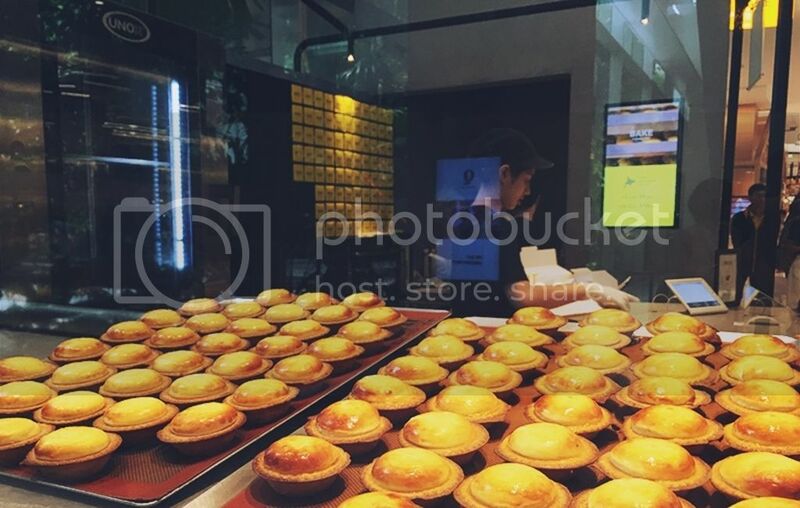 There is this huge craze in SG about these tarts and you have to queue at least 2 hours for it at Orchard Ion but as you can see from the photo, no queue at all. I loved the cheese (not too overpowering) and the crust was really nice. Not cheap though. EmQuartier is basically a quite ATAS mall with international brands like H&M, just like our Orchard Ion. 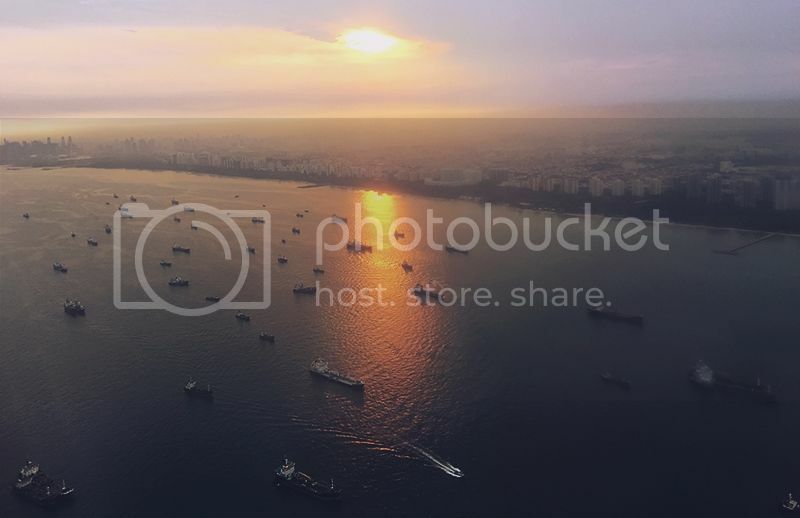 The overall design and concept of the mall is pretty interesting but if you want the whole “bangkok experience” with all the local food, cheap shopping etc, then you can probably give this mall a miss. I just read online that they have another outlet at Central World, which is so much nearer and within walking distance. It was Kelvin’s first time to BKK and i told him he must try After you toast so i brought him to the outlet at Central World. Had the Ferrero Rocher toast in baby size and he loved it! It was so good that we kinda regret not paying a bit more for the regular size. It’s not cheap in local context though, one of the more pricey dessert. Wanted to head back for another session but i forgot why we didn’t. Either we didn’t have the time to head back or we finished our money, LOL There are a few other outlets within BKK too. Another one of my favourite cafe in BKK. The design of the cafe is so whimsical and they have a huge variety of desserts! 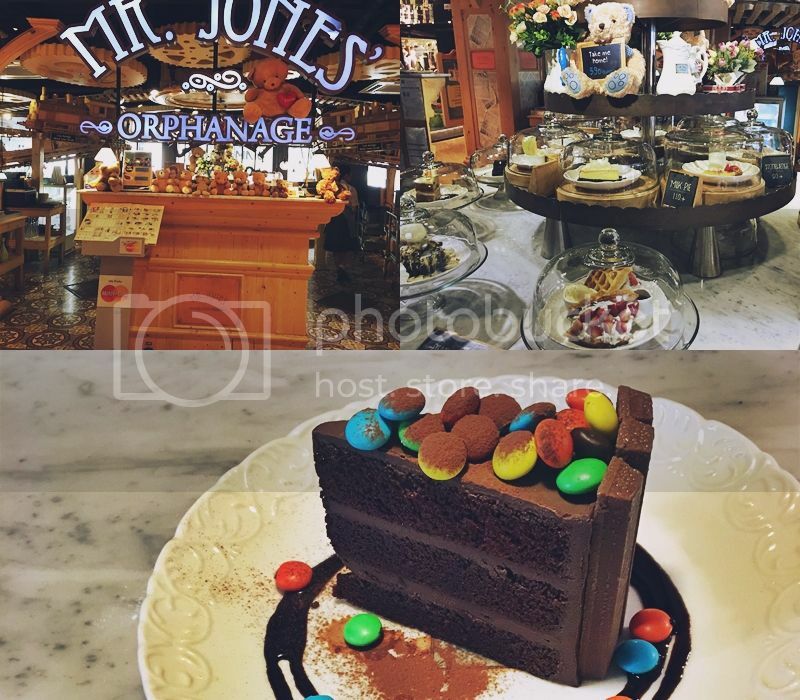 Had their signature Kit Kat cake which is one of their more instagram-able dessert. I love their strawberries and cream waffle too! MBK is like a shopping mall but honestly there is nothing much to shop there. However if you are look for AAA quality of branded items, this is probably where you can find them. I was googling on where to eat in the area and apparently there are a lot of hidden gem inside MBK’s food court! Kelvin had their chicken basil rice (55 baht, SGD2.20!) and i had Stewed pork leg rice (60 baht, SGD2.40!) Everything is so cheap and good! 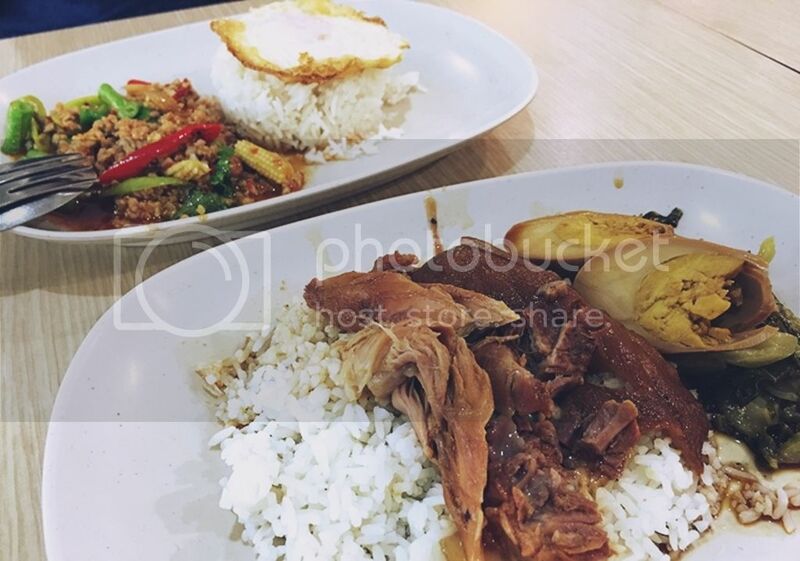 Checkout this link on the 12 must eat dish at MBK by Ladyironchef (http://www.ladyironchef.com/2016/02/bangkok-mbk-food-court/) Payment is made via contactless card so remember to get one from the counter before heading to the food stalls. Remaining value can be refunded at the end of the day. I’m not sure about the coconut ice cream sold at other places but nothing beats a cool refreshing coconut ice cream during hot weather. 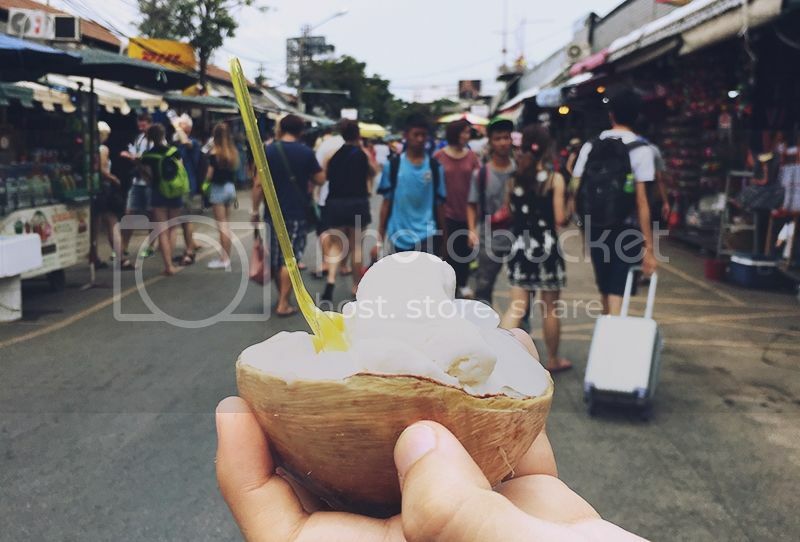 I’m totally not a coconut person but the ones i tried at Chatuchak was really good. It even comes with free flow of toppings like sweet corn, attap seed, red bean etc. It comes in a coconut husk which you can scrape the flesh off after finishing the ice cream! Was thinking of what to have for dinner and we thought we should have authentic mookata since we are in BKK so i went to google on where to have mookata and i found out about Pla Thong Mookata which offer Mookata buffet at only 159 baht ($6.40) per person!!! It’s like the ultimate deal! They offer fried items like french fries, nuggets etc, different types of raw meat and veggies, fruits and even free flow of coconut ice cream! Drinks are charged separately though and they cost almost as much as the buffet though, LOL (One large bottle of coke is about 120 baht) The place is huge and the crowd started to build up as it approaches dinner time. It gets a bit noisy but i guess it’s all about the authentic “mookata experience” in Bangkok, HAHA. Food is average but nothing to complain since it’s already so cheap. 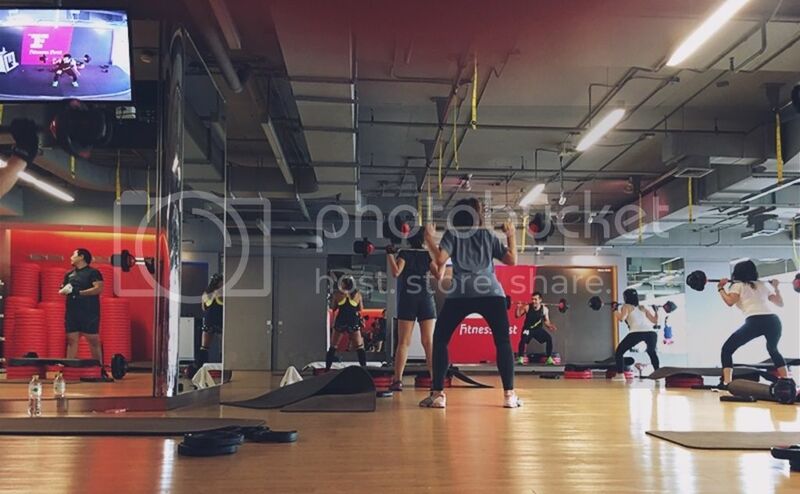 Pantip plaza may sound unfamiliar to most of us but it’s basically just a couple malls away from Platinum mall. 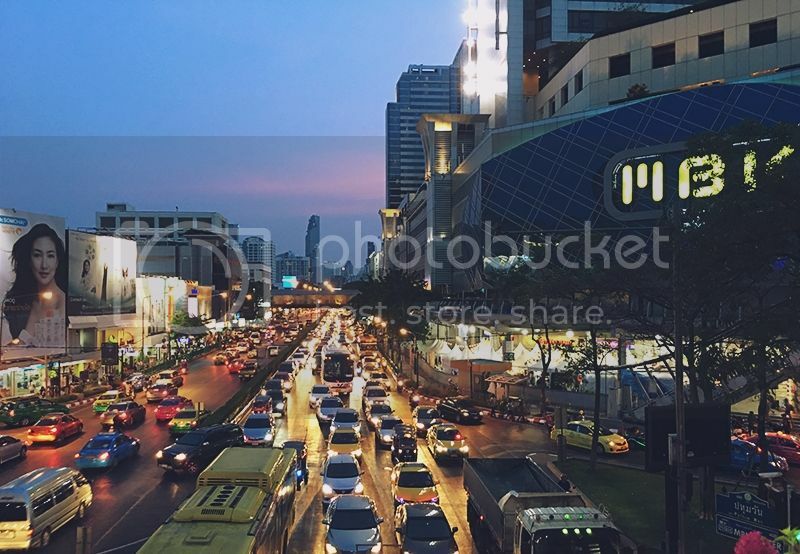 It’s like BKK’s version of our Sim Lim Square. 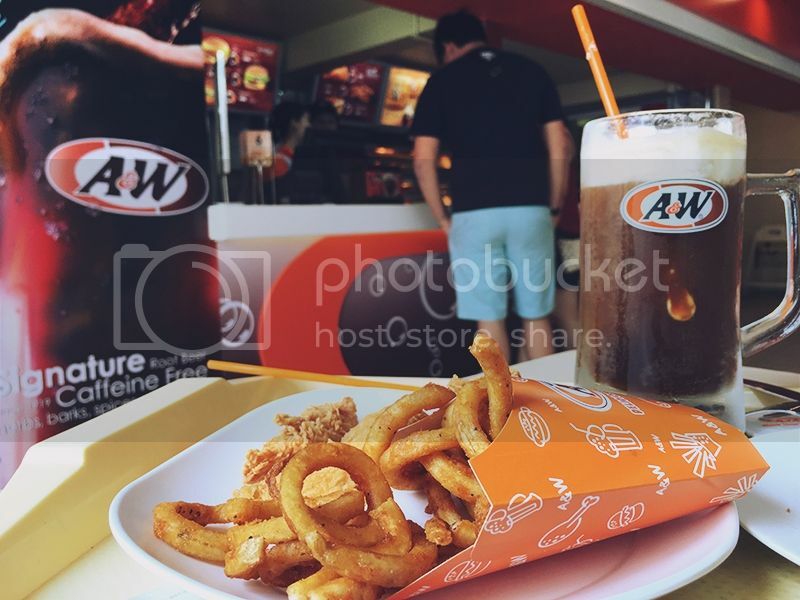 A&W is not exactly a must eat in BKK but for those who miss their chicken, waffles or signature root beer float, it’s just a stone throw away from Platinum mall so why not? 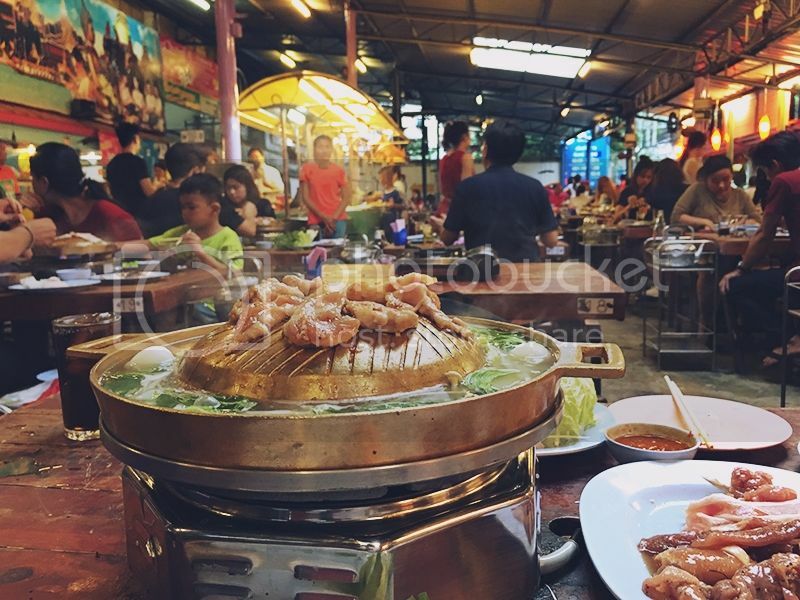 If you walk from platinum mall towards Siam, you will definitely pass by this stretch of road side stalls with locals trying to push their menu into your hands and getting you and your friends to sit down for a meal. 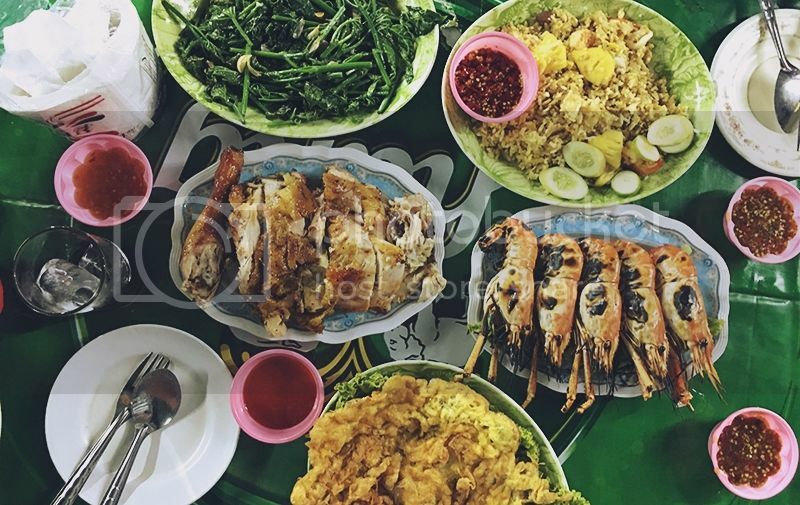 You will probably see their signature salt crusted fish and huge grill prawns along the way. Honestly the food is not bad and pretty cheap too. As you can see from the above photo, we ordered a plate of stir fried kang kong, a plate of pineapple rice, roasted chicken, egg omelette and a plate of grilled prawns just for 2 person (i know we seriously over-ordered...) and the meal cost us about 900 baht, which is about SGD36. 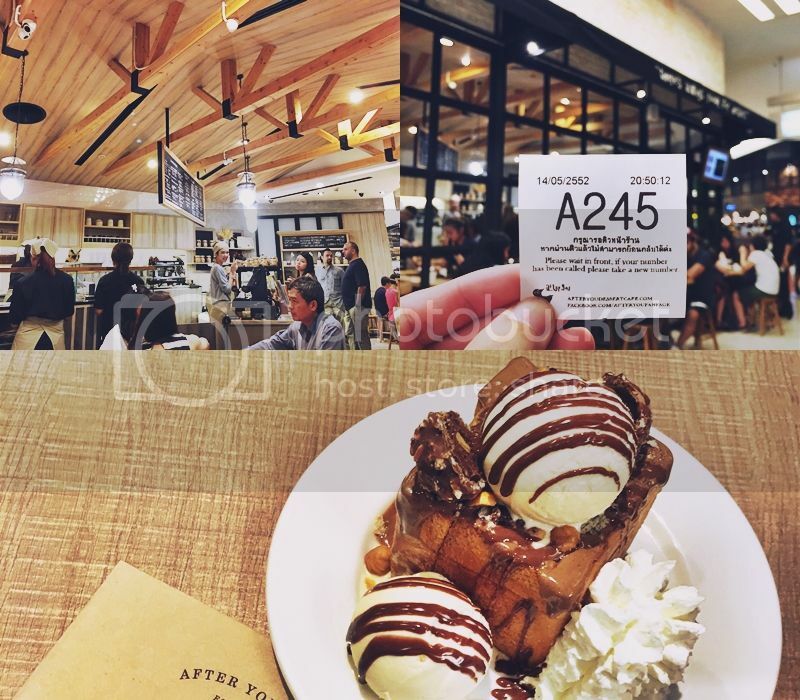 Slightly pricey in local context but we can never get the same amount of food in SG with just 36 bucks so i think it’s quite worth it, especially if you are sharing with a group of friends. 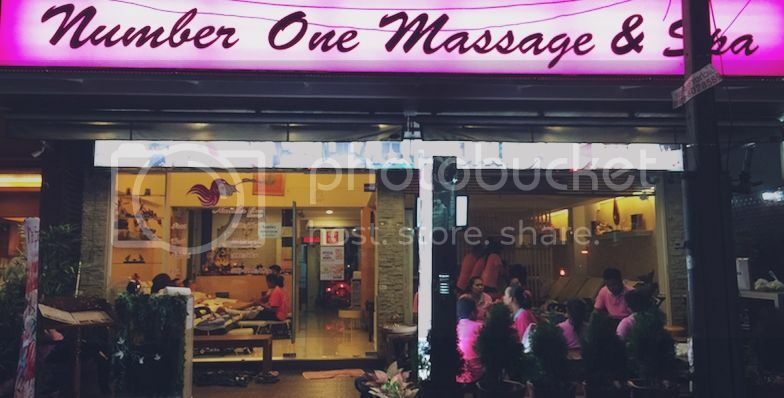 I think this place was recommended by Angie during the Cousin* BKK trip and apparently this massage place is really popular among singaporeans. It’s like Singaporeans will even take the tuk tuk all the way here just for their massage. Did their foot massage for 250 baht ($10) for an hour. After a whole day of walking and shopping, the least you could do is pamper your legs, LOL They provide free WIFI too!